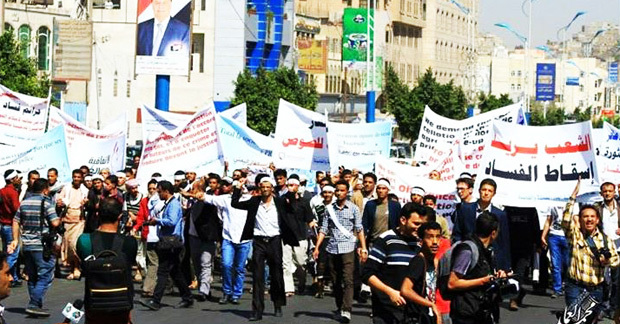 Hundreds of Yemenis protested on the streets of Sanaa against the government’s ongoing negotiations with French oil company Total about the pricing of liquefied natural gas (LNG), which is one of the main sources of the country’s wealth. Protestors claimed that Yemenis have lost hundreds of millions of dollars of potential earnings from the country’s resource wealth, which could have been injected into the state’s budget to provide basic services. Current gas market prices hover around US$14 per million metric British thermal units (MMBtu), yet Total, as part of an international consortium that has a 39.6 per cent stake in the US$4.5 billion LNG plant located on the strategic Gulf of Aden, has been buying LNG at the much lower rate of US$1.50/MMBtu. The 20-year sales contracts with Total, Kogas and GDF Suez were signed in 2005 under the leadership of deposed president Ali Abdullah Saleh at prices below the global standards. The Yemeni Team for Transparency & Integrity, Transparency International’s local chapter, issued a statement amid the current negotiations calling for “accountability and prosecution of those in the former regime who signed opaque deals”. Protestors holding signs saying “The people want the downfall of corruption”. In February 2011, millions of Yemenis protested against the 33-year autocratic rule of Saleh, eventually deposing him after 10 months. However, under the Gulf Cooperation Council’s power-transfer deal to current President Abd Rabbu Mansour Hadi, Saleh is immune from prosecution for corruption and political violence under his reign. The government has promised “to take all necessary steps to prosecute those to be found guilty in corrupt deals in domestic and international courts whether they are high-ranking officials or businessmen”. In a country where half of the population lives below the poverty line, the reality is that this has been a slow and frustrating process, which has triggered the latest round of protests. 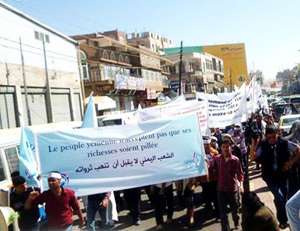 Crowds bearing the message: “The Yemeni people do not accept that their wealth is being stolen”. Nabil Abdel Hafiz, newly appointed chair of theYemeni Team for Transparency & Integrity, who participated in the Sanaa protest, announced that local civil society organisations will form a coalition to work on the recovery of stolen assets, especially from the extractives sector. In 2013 the Yemeni chapter, in partnership with Transparency International, produced the documentary and report, It belongs to you: Public information in Yemen. The research highlighted how important access to information is, particularly in the extractives sector, as it reduces “the opportunity for large-scale corruption and allows revenue from this sector to be properly used for the socio-economic development of the country”. The same demands at the outset of the Arab Spring still stand – the corrupt must be held accountable.